Larger marketing budgets and an influx of direct-to-consumer businesses mean that organizations can’t just outspend their competitors anymore—they must outsmart them to survive and succeed. In the past 5 years, venture capital firms have invested more than $3 billion in direct-to-consumer CPG startups, which typically sell uniquely-branded household items to customers via online shops. This sector has grown rapidly, posing challenges to large incumbents, whether by competing on price or by zeroing in on the “pain points” associated with specific products. 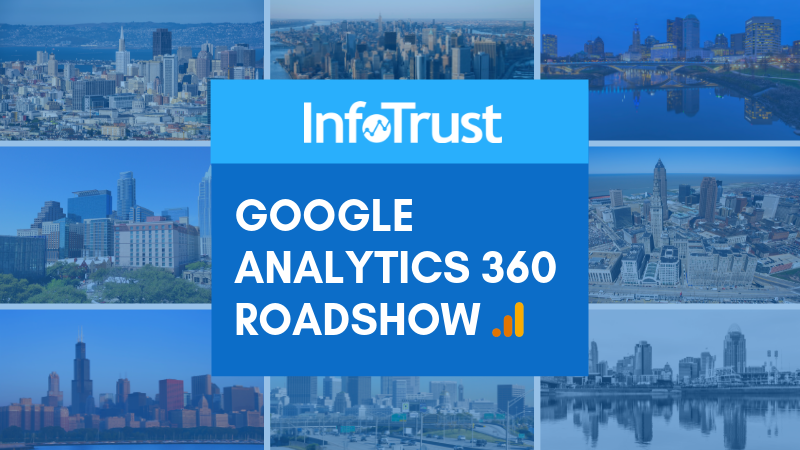 To help established enterprises become smarter about their digital marketing, InfoTrust is organizing a one-of-a-kind DTC/eCommerce roadshow to help businesses market smarter with Google Analytics 360 and Google Marketing Platform. There are hundreds of tools marketers can choose from, often resulting is an incomplete marketing platform, poorly selected solutions, and a disintegrated ecosystem that costs a lot of money and is slowed down by manual work. In this roadshow, InfoTrust will instead share how to leverage the best-in-class Google Marketing Platform (GMP). As a digital analytics partner for 10 top consumer goods companies in the world and dozens of top-performing internet retailers, InfoTrust has put together a methodology to help organizations identify, attract, and grow their best customer segment with GMP. We’ll be sharing this methodology and more. InfoTrust was a key enabler in deploying our analytics and data strategy. They easily grab the complexity of our global company. Their knowledge, deep expertise, and most importantly, their dedication and passion was a step-change for our company. As of Q2 2018, 2.78 percent of eCommerce website visits converted into purchases (per Statista), leaving much room for improvement. One of the keys to success for organizations competing in the DTC space is customer data. Many organizations today have a myriad of siloed systems containing various scraps of data about customer interactions, but no clear way to pull them together. In every roadshow session, we’ll talk about winning, long-term strategies and help marketers understand how solutions like Google Marketing Platform can grow their business right now. There are many opportunities in the eCommerce space, but also many challenges that are putting companies out of business. According to TIBCO 2018 CXO Innovation Survey, the biggest obstacles in digital are limited time and resources, limited to no budget, security concerns, lack of new skillsets, and user acceptance. There is no time to build your own marketing stack, and you don’t have years to integrate your CRM with your analytics. Challenging times present the greatest opportunities for marketers to succeed. We’ll be making stops in San Francisco, New York, Chicago, Atlanta, Columbus, Austin, and Cleveland. Join us for insightful sessions and meet other enterprise C-Suite marketers and IT professionals. 2019 is the time to advance your business and career with analytics. Click the button below to view roadshow dates and reserve your seat.